December 3 is the International Day of Persons with Disabilities. INMED’s aquaponics program is empowering individuals with disabilities to participate in the mainstream economy. A combination of hydroponics (soilless crop production) and aquaculture(fish farming), aquaponic grow beds are wheelchair accessible and do not require heavy labor to maintain. In South Africa, INMED has worked in the disability sector since 2012. With the support of the United Nations Environment Programme, we helped the Monyakeng Disabled People South Africa farming cooperative launch an aquaponics enterprise in the Limpopo province. USAID is helping INMED expand this project and launch two others to provide direct training and technical assistance in sustainable, climate-change adaptive agriculture, as well as substantial inputs to enable members of disabled persons’ cooperative groups in the Free State and Limpopo. 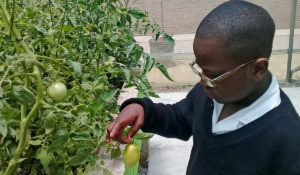 In partnership with Air Products South Africa, INMED recently installed an aquaponics system at Laerskool Kempton Park, a primary school that serves children with special needs in Johannesburg, where this young man is learning to tend some tomato plants. The vegetables and fish grown in this system are supplementing the school’s meals.